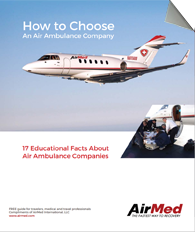 Most insurance plans, HMO's, PPO's and IPO's, appreciate and cover air ambulance services. However, it's important to check your plan to see that there is an air ambulance benefit and ensure that you meet your provider's eligibility criteria. Realizing that this can be an inconvenience, AirMed staffs full time specialists that will assist with insurance pre-authorization and payment options. Please inquire today at 205-443-4840 or toll free at 800-356-2161 and a specialist will be happy to help you.